That’s right, I’ve got trouble. Right here in Writing City. I’ve got trouble with a capital T and I don’t know the rest of the song. I never saw the “Music Man”. Which is odd because I feel like I have seen everything else. I have even seen “Cats” (that’s about a hundred and fifty bucks and two hours of my life I can’t get back). But I digress. The story in my head isn’t working. I’ve got about two paragraphs and I am about two seconds away from chalking them up to the computer delete gods. The main guy’s name is wrong. I like the girl’s name. My back is killing me. Yoda already threw his stick at me and told me “Writer you Are not”. I am also off the coke zero. I am basically in writer’s block hell. Care to join me? I hear they have great package deals this time of year. Well, I have been writing blogs like a fiend today. I wrote about six of them today. Two on here, the other four are at my website (shameless plug in 5…4…3…2….1 www.mwittle.wordpress.com). I have been texting everyone and his or her mother (that reminds me, yours says hello and she is a bit upset you haven’t called…you might want to get on that). I have even been writing on people’s walls on facebook. I am doing everything to avoid writing this story. Could I possibly have lost my writing mojo? Maybe it’s much simpler than that. I think I am having such a hard time with this story because it isn’t the one I should be telling right now. My characters are just in my head. They haven’t really walked around enough in there to start making their exits onto the computer screen. Maybe I am just hiding this story from the real one I need to write. But that other story is so much harder. So I am avoiding it. Because I am avoiding it, it won’t let me write anything else. So I have to write it. Do I have to start at the beginning? Can’t I just write what I need to write and let the story take shape from there? Where is it written that a story’s first draft must start at the beginning? It’s my story. I’ll do what I want. But I don’t want to write it. Maybe I’ll check my facebook again. I can go see my word press blog. I can check my email. Perhaps pet my cat. It is getting late and I do have school tomorrow…maybe I should just call it a night. All of this so I don’t have to write my story. So, why do I have to write it? Why can’t I just do what I want? Writers are never in control of their talent. It rules us. I have no choice. I have to write that story. What’s that Yoda? Are you smiling? Or is it just gas? It’s in my head. It’s a new story. I don’t know where it is going on how long it will be, but the characters are already restless. They are yelling at me to get on with it. They want to be on the computer screen. My Mac is happy again. We had a small fight in the beginning. It yelled at me for staying away so long. There were some unkind words said on both parties. But now we are fine. We are rolling again. I feel that story in my mind. It wants out. But then my other stories are sad. When do they get their moment in the sun? When will it be there turn to get rejected by the masses? How can I write something new when I have so many other stories half way done? Don’t even get me started on my novel! Meredith keeps giving me the finger (she isn’t that nice of a kid…I think BDoub is rubbing off on her). However, my stories bring up a good point. Why can I start something new when I have so many stories undone? I just don’t have a choice. I have to get this new story out because if I don’t it will consume me. I won’t be able to do anything else until I get it started. Yes I want to finish my novel. Sure, I want that story about Mike to come out. That Gettysburg story is cool. I will get to them. I know I will do it. I just have to get this one new story out. Recently my past has been popping up. Pictures of me when I was real small are finding their way on the Internet. My memories are flooding back to me. I have to find the reason why. I have to write this new story. Oh, the life of a writer. I am a total writer slacker. My Mac has laid dormant for about two months. I am sure I have about twenty new updates for it. Yet, I still don’t touch it. I went back into teaching and forgot about writing. Well, that was until a few days ago. On my blog (www.mwittle.wordpress.com) I talked about a picture someone posted of me when I was in the fourth grade. The picture freaked me out because it resurfaced a lot of things I buried deep in my brain. But my mommy always said that things happen for a reason. This lady on Christmas told me that I had to yell at my dead father. I know that things aren’t always as simple as they sound. Sure, I could go to his grave and scream my head off (and then be carried away in a lovely white coat). Maybe I could will it to happen in a dream. Or maybe I need to write him a letter. A very long letter that would roughly be the size of a book. Hence my new book idea is born. Sure, I wonder if we really need another book about a little girl and a dead dad. But all I can really do is write what I feel and let the book take its shape. It won’t be easy because I will be writing about things I haven’t thought about in years. I have no idea how to start it. I can make a million excuses. The bottom line is it is time to write this book. If nothing comes from it at least I will finally have all that is buried inside me out of me and neatly placed on a shelf. So on Saturday, I will be completely alone with just my mac and my thoughts. I’ll be dead by Tuesday. I am so sorry for not blogging. I have just been overwhelmed by teaching. See…this is why I left the profession to begin with. I can’t seem to get myself to write. How do teachers get kids to write? We put a gun to their head. No, that isn’t true. I am not too sure how others get kids to write but I am willing to share with you how I get mine to write. First, we are creatures who love talking about things we know. What better subject do we know then ourselves? I don’t want to hear people say that they don’t like talking about themselves because all that really boils down to is a self esteem issue. You just want permission to talk about yourself and if someone is asking you about, well, you then it is a given that they do really want to hear about you. So, my first point is, give the kids something easy to write about…maybe something they love or have a subject they have a strong emotional feeling towards. If it is something they can talk about for a long time, then they will have plenty of material to draw from. Secondly, give them structure. Give them a formula that their writing has to conform to and it will give them more confidence to write. Also it will help the kids stay organized and that will make them feel better. Most of the time, kids don’t know what to do with all the information they have and they just get sentence overload. If they know they have a set structure, it really calms them down. Third, if this is the first or second time they are writing for you, don’t make the papers bleed with red pen. Just look for the most horrific mistakes and correct those for the kids. Then, once they master those mistakes, start tackling the other ones. Nothing stops a student more then a bloody paper. Lastly, show them examples. I always write the same assignment I am asking the kids to write. It helps them because then they can see a different example of how to approach the writing and also they like knowing I am doing the same thing they are doing. Once the students hand in some of the work, let them share their work if they want or share the good parts of some of the student paper’s. Writing is such an uncomfortable thing to do if you aren’t used to writing. So, the best way to combat resistance is to ease kids into writing and raise their comfort level. As soon as they start feeling successful, it will become easier for them to write. 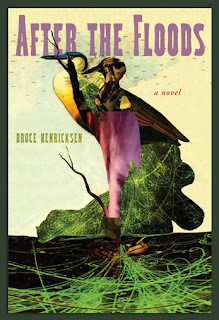 About ninety pages into Bruce Henricksen’s imaginative take on post-Katrina Middle America, After the Floods (Lost Hills Books, 2007), a pair of crows named Ruby and George debate the relative merits of various building materials for their new nest. Yarn or string? Old twigs for a rustic effect, or new twigs for resilience, strength, and pliability? More to the point, should they build a two-room nest in the unlikely event that they receive guests, or would a more traditional one-room nest be more appropriate? While the tone of this passage is certainly fanciful, it speaks nicely to the overall theme of rebuilding that runs throughout the novel. Despite its roots in the tragedy of Hurricane Katrina and its aftermath, After the Floods is ultimately a hopeful novel that reflects the strength not only of the human spirit, but of nature as well: strength to survive, strength to rebuild, strength to move on. The prominence of anthropomorphic characters like Ruby and George (as well as that of a number of dogs who speak among themselves of “the new phenomenon of thought” brought on by the hurricane), gives the novel a somewhat fanciful air, but Henricksen never stoops to Disneyfying his creatures. Rather, he imbues them with a strong sense of humanity by making them worry about the same things that we all worry about — namely various forms of change like displacement and old age. In some ways, it can be argued that Henrickson’s crows are distant cousins to the falcon of William Butler Yeats’s “The Second Coming.” But where the inability of Yeats’s falcon to hear the falconer signals anarchy and that things can only “fall apart,” Henricksen’s crows are distinctly American in their independence. That is, they’re wild birds and have no need for a falconer to tell them what to do; instead, they improvise and make their own order from a chaotic world, as do the human characters of After the Floods. Overall, After the Floods is a thoroughly enjoyable novel. Its talking animals remind us of the fine line that separates humanity from its own base needs and animal tendencies (a la George Orwell‘s Animal Farm), and the near-stream-of-consciousness nature of the narration is in many instances reminiscent of James Joyce. A wonderfully imagined rumination on humanity’s response to disaster.